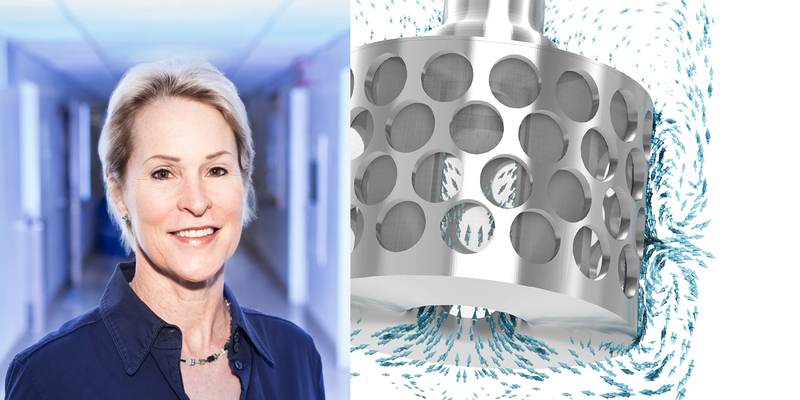 The nobelprize winner Francis H. Arnold and her research team is using one rotating bed reactor from the Umeåbased company SpinChem. The picture is a montage. The Royal Swedish Academy of Sciences has decided to award the Nobel Prize in Chemistry 2018 with one half to Frances H. Arnold from California Institute of Technology for the directed evolution of enzymes. This is a very important and environmentally-friendly advance in the production of e.g. pharmaceuticals, fine chemicals and biofuel. SpinChem is a privately held company in Umeå, Sweden, that develops innovative rotating bed reactors (RBR) for synthesis, manufacturing and purification in the chemical and biotechnology industries. The company provides solutions from laboratory to production scale for customers worldwide. The RBR technology has been developed in Umeå and is extensively patented by the company. One of the customers of SpinChem is Francis H. Arnold and her research team. The company states on its website that they are proud to have delivered a SpinChem rotating bed reactor system to professor Arnold’s team, and hope that it will prove to be a useful tool in further researching modified biocatalysts. SpinChem was founded 11 years ago and has during the years received support from the EEN-office at Uminova Innovation.